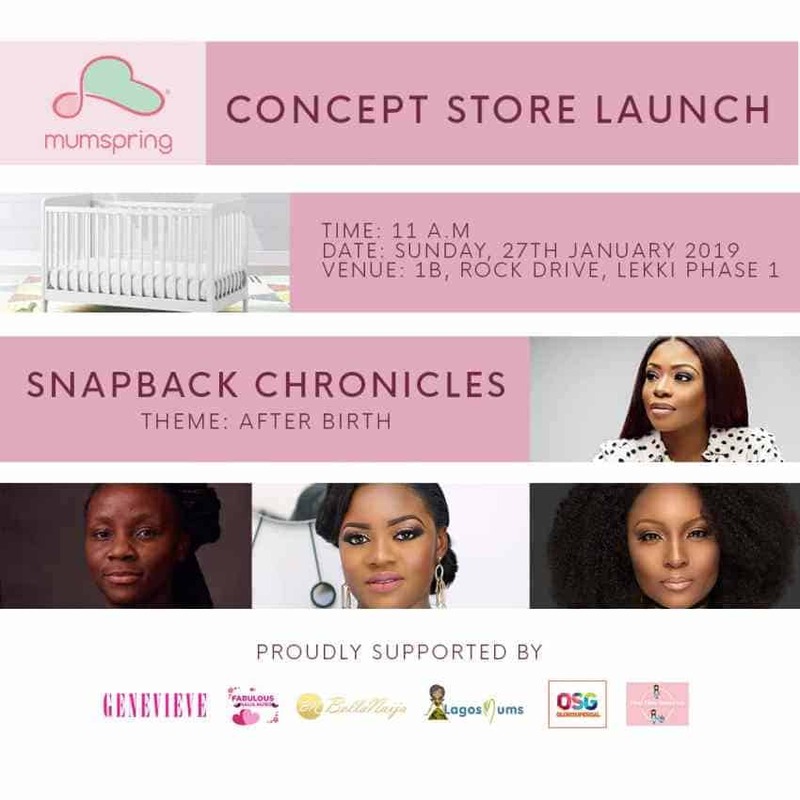 Mumspring’s Concept store launch and Snapback Chronicles held on Sunday, January 27th 2019. It was a huge success thanks to the convener Abisola Tolu Odutola and the keynote speakers; Marcy Dolapo Oni Sijuwade, Osas Ighodaro and Dr Gbonjubola Babalola Abiri. The event started at 11 am with the Concept store launch. There were a lot of amazing Baby products to purchase. It was then closely followed by the Snapback Chronicles which was an enlightening gathering. Although the event was meant for first time mums and expectant mums, there were future mums and Mums with experience in attendance as well. There was great conversation, laughter and tears. Mums shared their pregnancy experience on Natural birth, Vaginal birth and Cesarean section. They also talked about pregnancy myths. A major concern was not knowing how to Snapback after pregnancy. Mums complained about not knowing how to get back to work, not knowing what to do with the pre pregnancy weight and being confused about what fashion styles will work and what won’t. The speakers explained that Snapback is a process. Every pregnancy is different so don’t compare yourself to anybody. It took nine months to gain all that weight, give it time. They also talked about medical conditions that can happen after delivery I.e Diastitis Recti. Mums were advised to do a lot of research so that they will have an idea about what is happening to their body at every point. Post partum depression is real and it manifests in different ways for different people. For some, it is feeling really overwhelmed and then not knowing whether to just love your baby and ignore everything else or to ask for help. For other mums, it is depression about not Snapping back immediately to their pre-baby size etc. Dr Abiri, the consultant psychologist who was in attendance reiterated that it’s okay to not feel okay. Talk to someone about it and seek the help of your spouse and people around you; don’t shut people out. Let them help you heal. When it comes to pregnancy, there’s a lot that people don’t tell you especially about breastfeeding. Mums were advised to do a lot of research and not be scared to ask their doctors questions about everything and anything. Most often than not, husbands don’t know how to help their wives to care for new born babies. Not because they don’t want to, but because they don’t know how and it was agreed that this has to change. A lot of nuggets were shared at the Lagos edition of the Snapback Chronicles and mums left feeling encouraged and reassured that Snapback will definitely come but the process will be different for different people. We definitely look forward to the next edition. Weekend VVIP Invitation From Ruff N Tumble To LagosMums!